Still looking for a place to track all of your important 2016 events on, or maybe you just want to be able to stare at some beautiful artwork? Now, the official Nintendo UK Store is offering 25% off The Legend of Zelda 2016 calendars. 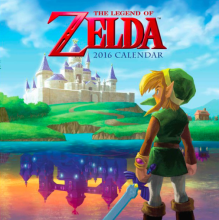 Featuring artwork from A Link Between Worlds, Skyward Sword and several other Zelda titles, you are sure to enjoy each months images. With the regular price of the calendar at only £12.99, the 25% off makes it a really sweet deal. Just enter code CALENDAR2016 at checkout to get you savings.